VVWRA and Vision Internet teamed up to create a beautiful new website for the citizens of Victorville, Apple Valley, and Hesperia. New services include online utility payments, an automatic e-notification system, and informative service directories. 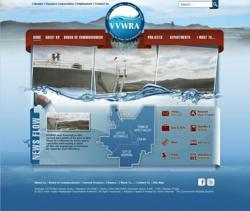 VVWRA launches dynamic government website with Vision Internet. With the launch of this beautiful government website, it feels like we’ve come out of the dark ages and are now on a level playing field with other agency of our size and scope. The Victor Valley Wastewater Reclamation Authority (VVWRA) is proud to announce the launch of their new website. Accessible at http://www.vvwra.com, the new site showcases a modern design, user-friendly navigation, and many helpful online services. The website’s content management system has been upgraded to the Vision CMS™, a government-specific content management system built by Vision Internet. This simple-to-use government CMS allows non-technical staff members to make content updates to the website. It also provides the technological platform for the many interactive components featured on the new website. Some of these features include online utility payments, an e-Notification system allowing users to subscribe to direct e-mail updates, and a Business Connection section housing important instructions, forms, and permits. The VVWRA now joins a growing list of California special districts that have taken the initiative to build powerful, effective websites to better serve their communities. This list includes innovative special districts such as the Orange County Sanitation District, the Mojave Air Quality Management District, and the Imperial Irrigation District. For more details on the new VVWRA website, please contact Vision Internet at 888.263.8847 or info(at)visioninternet(dot)com. Valley Wastewater Reclamation Authority was originally formed by the Mojave Water Agency to help meet the requirements of the federal Clean Water Act and provide wastewater treatment for the growing area. The original treatment plant, with supporting pipelines and infrastructure, began operating in 1981, providing tertiary level treatment for up to 4.5 million gallons per day (MGD). The VVWRA is now a joint powers authority and public agency of the state of California. Over the years, VVWRA has completed treatment plant upgrades and several capacity increases. Vision Internet is the leader in government website development with over 400 clients across the US and Canada. For 15 plus years Vision Internet has been creating industry-defining websites built on leading technology including the government content management system, the Vision CMS™. Widely recognized as the best government website vendor, the company has earned hundreds of prestigious industry awards for its unique websites. Reinvigorating the eGov outreach of every community they serve, Vision Internet has earned the title of the Government Website Experts.